The microphone displayed with this set is a type 21, these were first introduced in October 1940 so just a little too late for use in the Battle of Britain. The type most commonly used was the type 19 chamois leather covered microphone as seen in period photos. 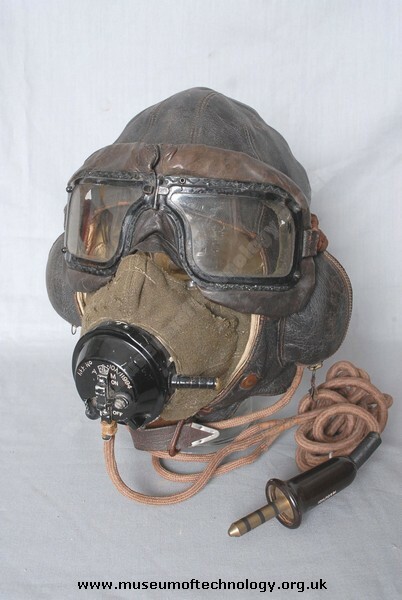 giving the pilots no eye protection from severe burns. I recently acquired on of these from my (now deceased) Grandpa, as well as his entire RCAF collection. In excellent condition. He served as a Bomber Instructor, from Hamilton Ontario CANADA. He was training for the invasion of Japan, in England when the War ended. His collection is remarkable, and a cherished gift.